... to note is the "Internal sensor offset ", added as a means to compensate for the excess heat inside the box of the controller. For each pin it can be defined when to go active, based on the difference (delta) between the external and internal sensors, or by absolute value of one of the sensors. If the selected value is greater than " activate" the pin will go ON, or OFF when the value is smaller than " deactivate ") - this will only work if the selected method of operation is "Auto " from the main window. 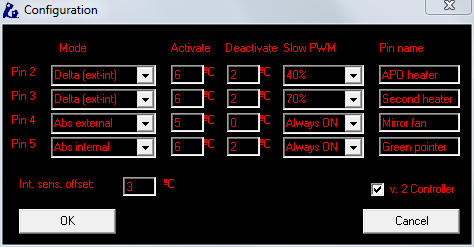 And of course, each pin will work at the % power chosen in Slow PWM - the pin will be active the percentage of time, the switching time being in the order of seconds. Last, if you controller is either an Armadillo2 or Platypus2, with all SubD-9 being female, then please select "v. 2 Controller" so the pins numbers are shown correctly.